The Fireballs in the Sky app allows you to get involved with the Desert Fireball Network research by reporting your own meteor sightings to our scientists. We use your reports to track the trajectories of meteors – from their orbit in space to where they might have landed on Earth. 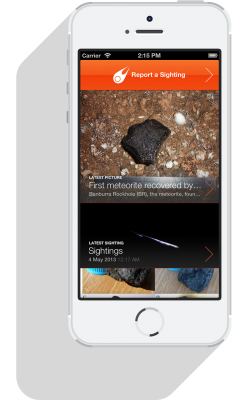 With our latest update, you can now use the app to go meteor gazing! Select ‘Meteor Showers’ or ‘Next Shower Peak’ to have your phone point you in the direction of the current meteor shower’s radiant. The radiant is the point in the sky where the meteors will appear to be coming from. Together with our app development partners ThoughtWorks, we have created an easy to use app for iOS and Android users. As well as reporting detailed meteor sightings, the app also keeps you up to date with the latest images, news and announcements from the Desert Fireball Network project. The Fireballs in the Sky app for iOS is designed to run on iPhone 4 or later iPhone models. The Fireballs in the Sky app for Android is designed to run on Android 4.0 or later versions.